Birthday Gifts For Dad Must Be Cool! Birthday gifts for dad are fun to shop for and to give. I've found lots personalized dad gifts at reasonable prices. Personalized gifts are a great value. In many cases, they're not as expensive as you would think. In fact, sometimes they're less expensive. I think their value is very high. Whenever I've received a personalized gift, it's been a wonderful surprise. Want your Dad to know how much you care? Show him with a great personalized shirt. You dad will be proud to wear these hats! These rank as top birthday gifts for Dad. Another Personalized Dad Gift - What a Mug! These are some great mugs for Dad. Some of these can be personalized and are perfect for commuting. 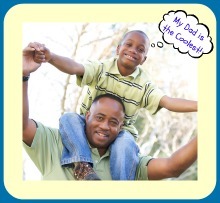 He will love these birthday gifts for dad. 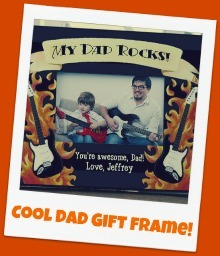 If you want to give Dad a really thoughtful gift - these frames are great. All of these can be personalized, and some you can add your own poem. When you pick a picture - look for one that will make him smile. Maybe find a photo that he has never seen or is long forgotten. Does your Dad enjoy beer? Well then give him a beer basket! This is a great gift to have delivered if you're not able to be with him on his birthday. Does your Dad love wine? Cellars Wine Club is a great option. If your Dad enjoys wine, give him an exceptional gift of a monthly wine club. This is a top rated wine club you can feel confident in selecting. For example - think about different poems for dad you could write. Homemade gifts for dad are another winner. Make homemade gift certificates. Include all the special chores you do for him or long forgotten things he'd like done. For example: good for 1 car wash, good for 1 garage clean-up, good for 5 shirts ironed, good for 1 car vacuum job, good for 1 batch of homemade cookies or homemade pie . . . whatever your dad would love! Well, I hope I've helped you find the perfect birthday gift for your Dad.